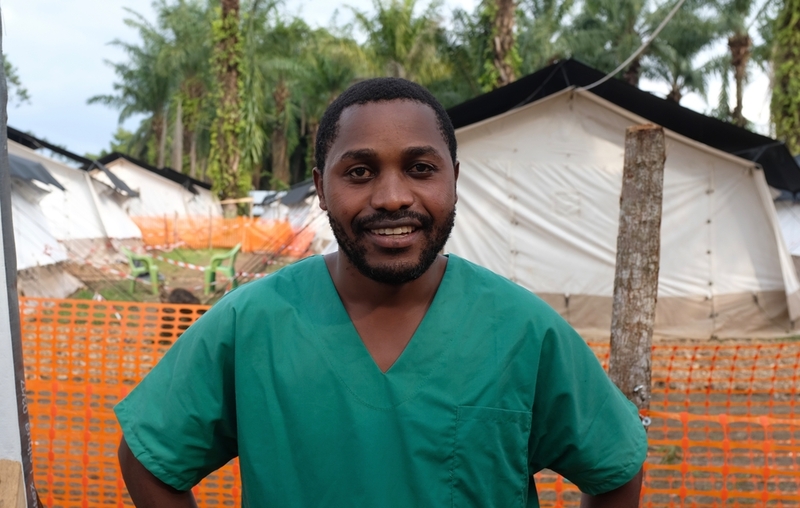 Congo Ebola outbreak: "We knew we had to act fast"
Patient Muhindo Kamavu was one the first MSF nurses to respond to the Ebola outbreak declared on 1 August in Mangina, North Kivu, Democratic Republic of Congo (DRC). Responding to both Ebola outbreaks in DRC this year, Patient has now finished his work in Mangina alongside the Ministry of Health and has headed to Butembo where he is setting up the response to positive cases diagnosed in the town of around one million people. “On 2 August, I received a call telling me Ebola had once again broken out in Congo and MSF were set to respond. Given that I have experience working with Ebola, they asked if I would be willing to come. ‘Sure,’ I said. ‘I’m available. Let’s go.’ I was on a plane less than 48 hours later. Our team of four experienced nurses arrived in Beni on 4 August, and we headed straight to Mangina that afternoon, to the local health centre that was at the epicentre of the outbreak. We knew we had to act fast. When we arrived, we saw that the centre was overwhelmed. They were doing their best, but the patients were all together in one ward of the hospital and they weren’t properly isolated. Staff and visitors were coming in and out. Inside there were bins and medical equipment on the floor. A number of health staff were ill, and the number of patients was increasing each day. This would be bad in a normal clinic, but during an Ebola outbreak, it’s dangerous. Without proper hygiene, health staff can easily get infected and then spread the virus to patients who visit the centre for other treatment. It was clear we couldn’t just wait for the Ebola Treatment Centre to be finished. The health centre was overwhelmed and people were dying now. We returned to Beni, prepared some material, and headed back to the health centre in Mangina. I wouldn’t say we were frightened of going inside, but we were a little nervous. The working conditions were unsafe, but we could see people were dying so we knew we had to help. At the time local staff were only using light protective equipment. So, the first thing we did was give the staff the right protective equipment and taught them how to use it, how to dress and how to undress. From there, we immediately established a fixed circuit for staff and patients in the centre. Having the right processes and patient flow in place is vital when you’re treating Ebola. It cuts down the risk of cross-contamination and makes the work safer for everyone. This is how Patient and his team found the health centre in Mangina. The Watsan team decontaminated the centre and had the mattresses replaced. Part of that process is establishing a set order to the day. We organised regular ward rounds and made sure there were staff present day and night. We ensured there were three staff at the triage at the front of the hospital and taught them how to identify patients who might be infected with Ebola. Suspect Ebola patients must be isolated to make sure they don't enter the general wards and spread the infection to staff or other patients. We also tried to set up case investigation for everybody who came through the triage with Ebola like symptoms. We made sure forms with contact details were filled out, so the teams working in the community could monitor contacts and understand how the virus was spreading. Thankfully, after a few days, MSF reinforcements arrived. We could now focus on patient care while our logistic and water and sanitation team worked day and night to complete an Ebola Treatment Centre that could care for patients in a safe way. It was incredible. We’d make visits to the site (about 300 metres from the health centre) just one day later and see a totally different hospital appearing. On the day we moved to the Ebola Treatment Centre, we had 37 patients and in the days that followed we had many more. But last week there were eight patients, two days ago five, and today, only two. When we see patients walk out cured, we dance. We are just so happy. I’m very proud of the work that we have done. It’s been hard, but we’ve achieved good results.